Painful memories linger on in the lives of men and women who supported the war in the name of the Japanese emperor. Their anguish gets passed on to the next generation. This novel deals with war's damaging effects and with a young Japanese-Canadian woman who confronts her family's past. Kerri Sakamoto won the Commonwealth Writers Prize for Best First Book for her first novel, The Electrical Field, which dealt with the internment of Japanese-Canadians during World War II. 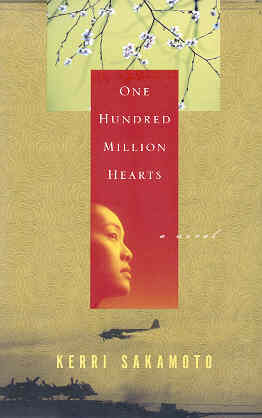 Her second novel, One Hundred Million Hearts, tells the story of two Japanese kamikaze pilots, one who died honorably and one who survived in shame, and the women closest to them. The novel's protagonist visits Japan for the first time to find out about her parents' hidden past, and the description of her travels, impressions, and feelings rings true. In much the same way, Sakamoto left Canada to visit Japan for three months to do research and to visit the places described in her book. Miyo Mori, a slightly crippled woman in her early 30s, and her father live a secluded life in Toronto. Soon after Miyo, a third-generation Japanese-Canadian, leaves her father's house to marry, her father dies. She finds out for the first time about a half-sister named Hana living in Tokyo, so she travels to Japan to meet her, and there she finds out about her father's secret past. Her father had moved from Canada to Manchuria, part of the Japan's empire at the time, and he then finished high school and entered the university in Tokyo. The army drafted him from the university in 1943, and he later became a kamikaze pilot in the Special Attack Forces. Miyo also finds out her mother was a hibakusha, who had radiation sickness from the atomic bomb dropped in Hiroshima, and Miyo's own physical ailments most likely came from her mother. Through Miyo's experiences and discoveries in Japan, she grows stronger both physically and emotionally. The story's two kamikaze pilots have distinct personalities. Miyo's father feared death before his scheduled mission, and he did not believe in the divinity of the emperor. Later, when he returned to Canada after the war's end, he suffered silently from guilt and shame as a failed kamikaze pilot who never completed his mission of death. Hajime, recruited from Tokyo University, served in the same unit as Miyo's father. As Hajime trained and waited for ten months before his fatal mission, he expressed his affection and his doubts in a series of letters to Kiku, his fiancée in Manchuria who he had never touched. The style and content of these letters differ from those written by real-life kamikaze pilots from Japan's top universities. For an intellectual, Hajime conveyed excessive dependence on Kiku to unravel his jumbled thoughts and to bolster his belief in the emperor. The letters have a directness and simplicity hardly ever found in the letters of Japanese soldiers during the war. During the war many people in Japan, including the characters in this book, viewed the deaths of kamikaze pilots as something pure and glorious. They deserved honor for their sacrifice on behalf of the emperor and their families. Koji Kuroda, the Japanese-Canadian friend of Miyo's father in Manchuria, served after the war for five years in prison as a war criminal. He wished he had been a kamikaze pilot, since he then could have received a warm send-off from his family and friends, and after his death everyone could have admired him. Even more than half century after the war, the women in this story continue to suffer from its effects. Each year when the cherry blossoms bloom, the war widows gather together to share their grief as Kiku reads to them the letters written by Hajime. Even though some of Hajime's letters expressing his doubts shame Kiku, she sobs as she wishes to join her fiancé. During the war she had longed to join Hajime in the same way as described in the state's wartime slogan, "one hundred million hearts as one human bullet." Hana, Miyo's half-sister, expresses her strong views against the emperor's war as an erratic artist who seems to be drawn uncontrollably to the widows of the kamikaze pilots. She feels great bitterness toward her father since he refused to acknowledge her as his daughter and never came to Japan to apologize to her. Probably because of this rejection, Hana became obsessed with her father's involvement in the war. The Yasukuni Shrine, Japan's national memorial to honor the spirits of its soldiers killed in wars, serves as a focal point in the story's action. When a kamikaze pilot died in battle, it was believed that he became a kami (god) and then bloomed again as a cherry blossom at Yasukuni. Many pilots said and wrote "see you at Yasukuni" when they departed on their final missions. In contrast to this image of Yasukuni as a paradise, Miyo considered the Shrine's museum, which displays kamikaze pilot photos, letters, and mementos, to be dreary. "The atmosphere was not fresh; it felt very still and old, like the water in a stagnant pond" (p. 249). The book's few references to specifics of the kamikaze operations contain some inaccuracies. Hajime and Miyo's father belonged to a kamikaze corps that used "mother and child" planes. This refers to a twin-engined bomber (mother) that carried underneath an ohka or rocket-propelled piloted bomb (child). Although the author describes Miyo's father as a pilot in the Imperial Japanese Army, only the Navy's Thunder Gods kamikaze corps used ohka bombs. The suicide mission of Hajime and Miyo's father occurred in August 1945, but the last attack using ohka bombs actually took place on June 22, 1945. Some of Hajime's letters have words blacked out to indicate the military censor's work, but the remaining contents of such letters never would have been allowed, with their references to a kamikaze pilot who purposely plunged his plane into the main hangar at his own base and to the practice at one base of strapping pilots in so they could not escape their duty to make a suicide plunge. Sakamoto depicts the racism that manifested itself in various forms and places during the war. Japanese Army officers treated Miyo's father cruelly since he was a nisei (second-generation Japanese-Canadian). Hana's mother, also a nisei, endured as an orphan in an internment camp in Canada during the war. Kuroda, who moved from Canada to Manchuria in 1938, exhibited the most repulsive form of racism. Believing the Chinese to be "dirty yellow skibbies," he tortured prisoners in Manchuria and knew about the experiments taking place on live human beings. One Hundred Million Hearts lets readers join Miyo in her journey to better understand the war and its effects. Along the way she meets several complex characters, many of them not attractive, but through these interactions she gains a better understanding of her life and history. The book also helps to dispel the common misconception of kamikaze pilots as crazy and fanatical young men.